'The Eternal Return of the Cosmic Star Child from the Songbook of the Invisible Sky' runs Thursday–Sunday, Dec. 10–20, at the Imaginists, 461 Sebastopol Ave., Santa Rosa. All shows 8pm. $5–$25. 707.528.7554. 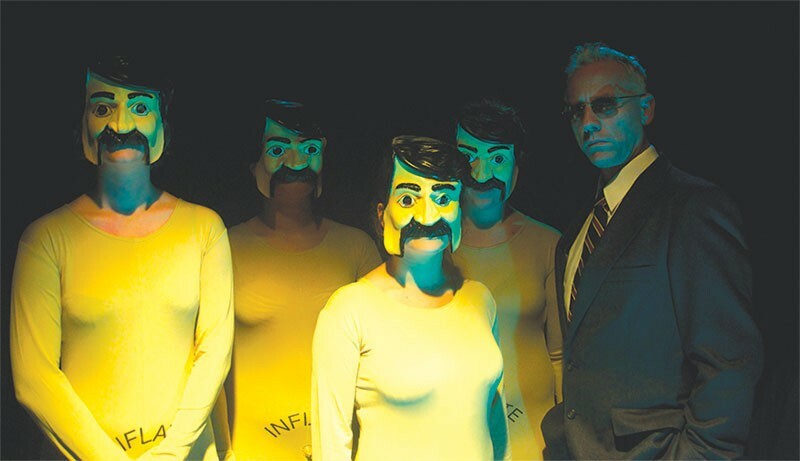 IMAGINE IT A Trump-esque CEO (Brent Lindsay, right) and his army of inflatable dolls hunt for the immaculate Star Child in new play from the Imaginists. 'In this art form, people hold on to old success stories and old models," says Brent Lindsay, "and I just want to punch right through that." As co-founder of Santa Rosa's experimental theater company the Imaginists, Lindsay and his partner, Amy Pinto, regularly push the boundaries of live theater with original works that are often subversive and challenging. The Imaginists' latest offering is also one of their most out-of-this-world productions. The Eternal Return of the Cosmic Star Child from the Songbook of the Invisible Sky is an interstellar operetta that takes inspiration from the nativity story and dials into current-day issues of xenophobia, spirituality and refugees for an intensely stirring musical that runs Dec. 10–20. Conceived of by Lindsay five weeks ago, and directed by Lindsay and Pinto, the new production is a collaborative effort with musical director and songwriter Charlie Davenport (Rags, Secret Cat) and experimental Santa Rosa band Snake Walk. Lindsay plays the King Herod–like role of a CEO who's after the miracle-born Star Child. The cast—which includes longtime Imaginists ensemble performers Rae Quintana, Amanda Artru, Quenby Dolgushkin as the protective Magi, and Katrina Dolgushkin as the motherly Mira—sing from four platforms under circling spotlights while the audience sits in the round. "I love working with Brent because he's so open and allows everybody to reach his or her potential," says Davenport, who makes his Imaginists debut in this show. "And because it's all written so quickly, it feels so current. Plus it's gorgeous to look at. It's like candy to watch." With the live band belting out original music that ranges from heavy guitar rock to sublime synthesizer atmospheres, the cast brings this bizarre songbook to life in a nontraditional way. "You want to make it complex enough that it keeps growing, not shrinking, not going dormant," Lindsay says. "For me, I want to make theater where people have to come a second time. That's what I want. The second time is almost always when people come up to me and tell me they loved it." A Santa Rosa native, Lindsay credits his love of theater with his old Analy High School drama teacher Amy Glazer, now a professor at San Jose State University and a well-known Bay Area director. "She changed my whole perception," says Lindsay. "I think what she did to me was she said, 'With disciple, this art form can be really exciting.'" After high school, though, live theater in the North Bay of the 1980s didn't offer Lindsay much excitement. He moved east and attended the North Carolina School of the Arts, where he met Pinto in 1986 when they were both enrolled in the theater department. After five years in New York City, where, among other gigs, Lindsay worked for the Living Theatre founder and off-Broadway force of nature Judith Malina, he and Pinto found themselves on a farm in southern Delaware. In 1994, they formed the experimental ensemble theater company KITUS (Knights of Indulgence Theatre United States), and, says Lindsay, conned the company into coming out west. They landed in Truckee and took over the scene there from 1997 to 2001, when KITUS disbanded. "We were all hitting 30 to 35 years old," says Lindsay. "And we were going, 'What are we doing?'" After that reality check, Lindsay and Pinto came to the North Bay, settled in Healdsburg and founded the Imaginists in 2001 as a small company and theater school. "I don't know that I knew I was going to be here," says Lindsay. "I knew there was something interesting about returning here and putting something in place that wasn't here for me." Ten students at the school turned into 40, then turned into waiting lists. Many of those original students, like Quenby and Katrina Dolgushkin, have now grown up alongside Lindsay and Pinto, and are regular members of the company today. The Imaginists moved to their current location in Santa Rosa's South A Street arts district in 2009, and for the last six years have been attracting diverse crowds and gaining national and international attention for their works. "The main focus is to get people to share their story," Lindsay says. "We build shows around themes and ideas, but it's always about people pitching in. For young people, to build up from their creative voice is really exciting. We try to look for interesting ways to keep young people excited about theater, showing them that theater can be whatever you want it to be.